The Liberty 404L Pump is a pre-assembled 1/3HP drain pump with a basin. These drain pump are applicable to bar sinks, laundry trays, dehumidifiers, utility sinks and gray wastewater drainage below gravity lines. The Liberty 404L drain pumps are designed for wastewater systems and will handle small debris such as laundry lint. This drain-pump has 2" connections and 3/8" solids-handling capabilities. The Liberty Pump 404L comes equipped with a float switch that has a piggyback plug for the temporary manual operation of the pump. A union must be installed just above the pump to facilitate removal if necessary for cleaning and service. Install a check valve above the union to prevent the backflow of water after each pump cycle. 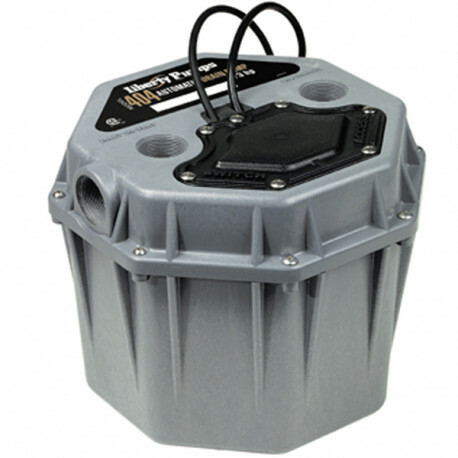 This drain pump's 2" vent allows extra volume for high suds conditions and to allow proper drainage of the fixture. The Liberty Pump 404L pre-assembled drain pump has a 2" discharge. The Liberty 404L also has two ports, one on the top of the drain pump and one on the side. They can either be used as a vent or inlet (2"). A trap shall be used between the fixture and the pump, a flange type is recommended. The Liberty Pump 404L pre-assembled drain pump has a total basin capacity of 4.3 gallons and can handle liquid temperatures up to 140F. Its oil-filled, hermetically sealed motor is equipped with thermal overload protection. This drain pump also has a separate access cover for easy switch inspection. The Liberty Pump 404L drain pump is not intended to be used with chemicals.